The recent decade has seen turbulent times for economies all around the world, and perhaps the most notable of such sufferings have been witnessed within Southern Europe. 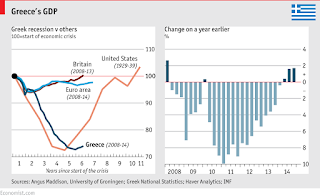 Spain, Portugal and Italy have fallen into economic turmoil, but one could argue that these problems pale in comparison to those being currently faced by Greece, a country where the last 6 years have seen unemployment triple, public debt ruthlessly pile up, and the economy shrink by a quarter. The lack of money in Greece's financial institutions is such that citizens are being warned of banks shutting down their ATM services, simply because there is not enough cash to give to people who want to withdraw from their own accounts. In 2012, the situation got so desperate that the government had to secretly ship in cash from abroad to prevent a shortage. But where did it all go wrong? 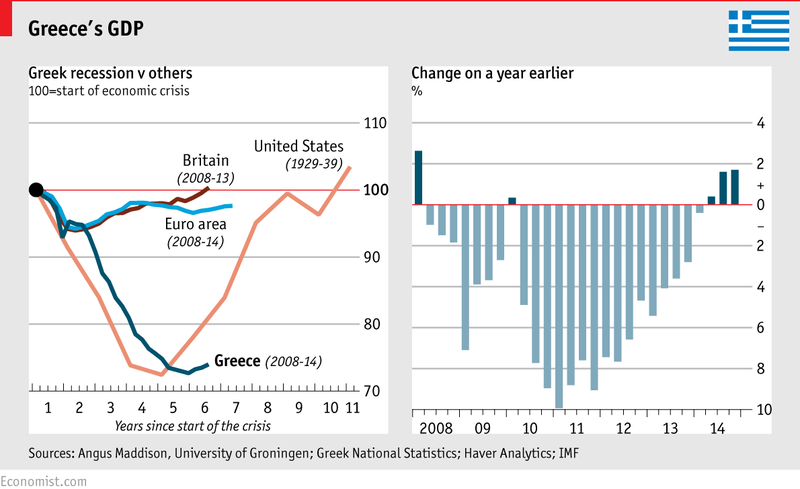 Why is it Greece in particular that has gone through even tougher times than the rest of Europe? Well, from the onset you can see that the deadly nail in Greece's economic coffin has been its borrowing from other countries and organisations such as the IMF, in order to finance public spending. argue that the Greek governments of recent decades have been 'bribing the electorate', providing public sector jobs that are overpaid in order to maintain popularity among the public- at the cost of long term economic stability. Spending also came in forms other than public sector employment. The 2004 Olympic Games, for example, put a crippling burden upon the government of $8.6bn, contributing to debt by 2005 amounting to €50,000 per household. What further compounded the economic struggles was the outbreak of tax evasion Greece has seen in the past decade, particularly since the financial crisis of 2008. 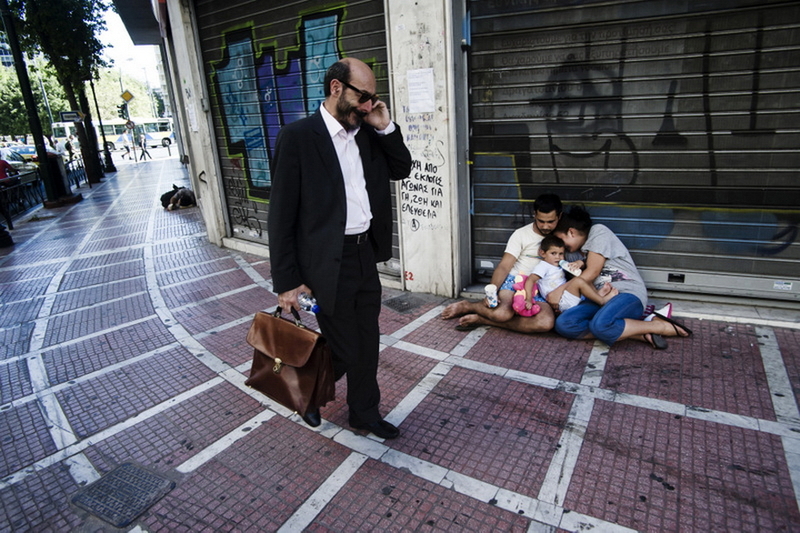 According to a Greek Finance Ministry Report, during the initial period of crisis, the state had only taxed a third of its citizens' officially declared income. More recently in 2013, it was revealed that the state collected only half of what was due in 2012. Such tax evasion activity has been estimated to cost the treasury over $20bn a year, and it has landed Greece the rather unenviable positions of having the lowest tax revenues per capita in Europe, and according to the 2012 Corruption Perception Index, being the most corrupt country in the EU. Greek Debt, visualised in trucks of cash. 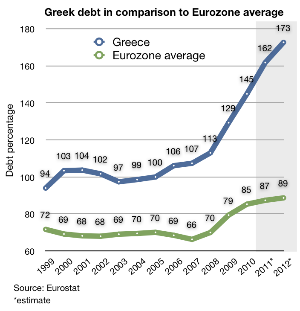 The consequence of such public spending in spite of a lack of revenue for the government has resulted in a colossal amount of debt being collected in Greece. As of now, Greece owes €360bn to the IMF, the ECB, and numerous lenders throughout Europe, notably from Germany, France and Italy. Theoretically, lending and borrowing usually works out for both parties. The general idea is that a country can borrow from another, and use that money to be productive and make more money, allowing them to pay back the lender and also make a profit. But Greece's situation is far from theoretical; despite efforts by the European community to reduce its debts (in 2011, the banks had to agree to half Greece's debts to them), the outlook is not rosy for the Mediterranean nation. Its newly elected leaders, the Syriza government are being brutally honest about how they see the future and fears are escalating that they will have to default on their debts, a move that will accompany an exit from the Eurozone and no doubt a long ensuing period of turmoil and instability, not just for Greece and its citizens, but for much of the rest of Europe too.